Some Guantanamo Bay detainees have already voluntarily taken the seasonal flu shot, facility spokeswoman says. Washington (CNN) -- The Pentagon will offer the H1N1 vaccination to detainees at the U.S. facility at Guantanamo Bay, officials there said Friday. But Rep. Bart Stupak, D-Michigan, urged the Pentagon to reconsider. 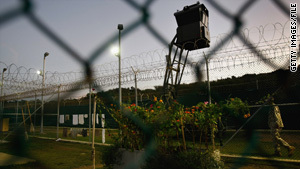 "As long as Americans must wait to receive the vaccine, the detainees in Guantanamo Bay should not be given preferential treatment to receive the H1N1 vaccination," Stupak said in a letter to Secretary of the Army John McHugh. "Until this shortage is addressed, I urge Pentagon officials to reconsider this decision to vaccinate terrorist detainees ahead of Americans who are waiting," Stupak said. Base officials had not received the vaccinations and did not know when they were expected to arrive, Haynie said. Once the vaccinations are received, doses will be administered to active-duty personnel before being offered to detainees and others on the base, Haynie said. The vaccination is mandatory for all uniformed personnel, she said. The vaccinations will be voluntary for the detainees, who will be briefed on the virus and the vaccine before they decide whether to receive the vaccine.